We are a Chili loving family, and we are always looking for a different chili or one that might have a special flavor. 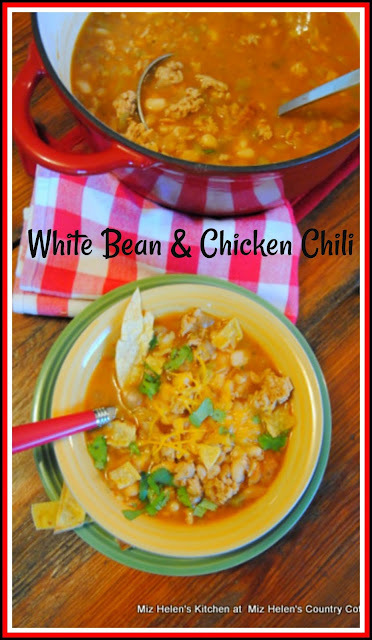 This White Bean & Chicken Chili has a very special flavor that we really enjoy. We have served this chili for many a game day gathering and it has also been a star at our Christmas Eve Mexican supper. It really is one of those recipes that will be great for any occasion. In a heavy dutch oven or soup pot, heat the vegetable oil. Cook the ground chicken, then add the onion, garlic, and green chili's. Add the chili powder, chipotle chili powder, cumin, oregano, salt, pepper and cayenne. Stir together until the spices are completely incorporated. Stir in the 2 cans of beans and mix well. Pour in the chicken broth and mix well. Tear the tortillas and mix in until they begin to dissolve into the chili mix. Cook on low heat for 30 minutes. Lower to simmer until ready to serve. If you want a thicker chili, add less chicken broth and more tortilla's. If you want a thinner chili, add more chicken broth and less tortilla's.
" sometimes we need to stretch it, and sometimes we don't"
Thanks so much for stopping by to spend some time in the kitchen with us today. Making Chili and eating it is a real fellowship meal and always better when shared with family and friends. Hope you have a great week and come back to see us real soon! Looks like a great cold night dinner! Thanks for sharing at the What's for Dinner Party! This looks amazing! I'm going to have to try it! We are a chili loving family as well. My husband would just assume I stick with my venison chili, but I love trying every kind I can think of! This looks like a great option!